Text: Why does your little girl love Mary Jane more than her other dolls? 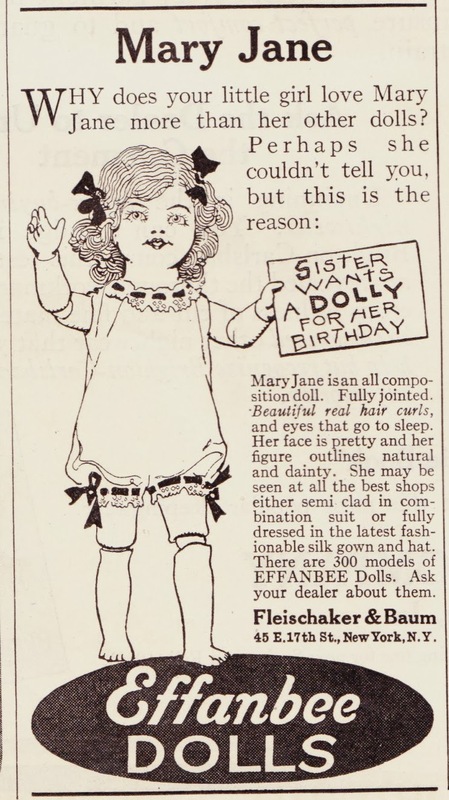 Perhaps she couldn't tell you, but this is the reason: Mary Jane is an all composition doll. Fully jointed. Beautiful real hair curls, and eyes that go to sleep. Her face is pretty and her figure outlines natural and dainty. She may be seen at all the best shops either semi clad in combination suit or fully dressed in the latest fashionable silk gown and hat. There are 300 models of EFFANBEE Dolls. Ask your dealer about them. FOVA #9: Keith's Plans "For the Nation's Homes"